A scene from Vinegar Tom. 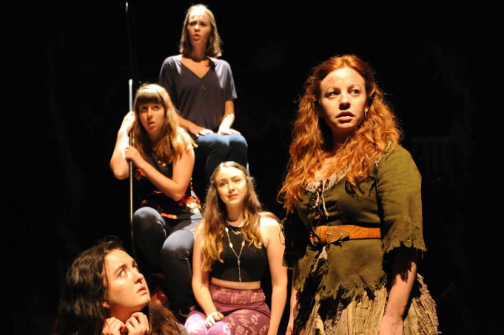 BOTTOM LINE: Persuasive and dangerous female power in two plays, Judith and Vinegar Tom are presented on a double bill of what could be two complete evenings of theater. Billed as a play about witches with no witches, Vinegar Tom is a rarely seen 1970's feminist delight of a play, complete with song, vaudeville, and cast of thousands. Most Americans have some passing familiarity with the Puritanical Witch Trials that in our world we most associate with playwright Arthur Miller. It’s with Churchill’s play that we are offered an English take on the story. There’s no John Proctor here. These ladies are on their own, fighting and cursing one another in vagrant displays of greed, jealousy, and manipulation. Churchill makes a play that is deeply sexual in nature, from an opening scene of a fabulously cast Alice (Tara Giordano) on top of Jack (Bill Army), mid action-shot. Both look and sound right out of the English countryside (much credit to whoever is responsible for the crisp dialects of all. No dialect coach is listed in the program.) Indeed, the women stay on top in more ways than just these opening moments. And Churchill asks us if this is a good idea in a world of “witches.” If she floats in water, she’s a witch; if she’s drowns, she’s dead. If we find a spot on her body that, when pricked, she does not bleed or feel pain, she’s also a witch. Nevermind the riddled corpse you’ve left behind. We must revisit Vinegar Tom. Decades after Roe vs. Wade, there are still abortion matters before our Supreme Court. A woman’s body is still a sinful place in many books, and catch-22’s abound, much like the drowned witch theory. Even more unsettling is Carol Christensen's music, as directed by Cheryl Faraone. Three women—Caitlin Rose Duffy, Joelle Mendoza, and Liana Barron—make up a thoroughly contemporary, almost barbershop-like trio, in a sea of rags from an unknown yesteryear. Their heels and jeans suggest a cyclical crime of blame and hypocrisy in female sexual politics. They have some of the juiciest lines in the whole play, sung with a smile—“I’m so wicked,” and “find something to burn” among them. It's wonderfully disturbing. Judith, by Howard Barker, is a story that may be familiar, by a playwright who may be less so. For me, Judith provided a rough start to this ultimately enjoyable evening. A war is raging. General Holofernes (Alex Draper) calls in Judith (Pamela J. Gray) for his sexual pleasure. A trusty Servant (Patricia Buckley) stands by to bend to every will of both the General and Judith. The endearing Buckley also appears as the sadistic Goody in Vinegar Tom; she’s a shining light in both. There are some unexpected turns in this sexual encounter. Both become disrobed and secrets are revealed. And the poetry doesn’t end there. I found the poetic banter to hold these actors and director Richard Romagnoli back; it never felt quite lived-in. That said, I would strongly recommend checking out the Potomac Theatre Project’s evening of plays to see Vinegar Tom.